Desktop Wallpaper Changer is a handy and very highly rated freeware desktop enhancement application which can download and automatically change your desktop wallpaper on not only Windows 7, but earlier versions of Windows including Vista and XP. The program currently uses very little CPU and memory and runs quietly in the background without much fuss. 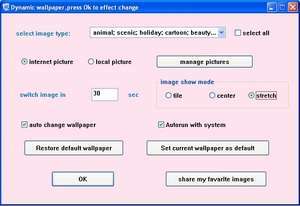 According to the maker of this freeware application, Desktop Wallpaper Changer fetches some of the most popular desktop backgrounds from the Internet and changes them automatically for you on an interval. For security reasons, you should also check out the Desktop Wallpaper Changer download at LO4D.com which includes virus and malware tests. Additional screenshots of this application download may be available, too.